Working at a fly shop, you can get a lot of information about a fishery in a short time. With this time of the year being the stonefly hatch on the Deschutes, I wanted to give a quick update report. The hatch is not over the peak, nor is it even that early this year. Everyone comes in insistently speculating that the hatch is already over the peak, or that the hatch is so early this year that it will end in the next few days. Reality is that it's just getting going as of right now. The first good reports I have heard were just over the last two days. They were the kind of reports that let you know the fish are just starting to key into the big dry flies. It takes a long time for the flies to crawl out, mate, and then fly back to drop their eggs in the water (which golden stones do). More often than not, you will start to see less bugs on the willows when the fish are actually keying onto them. People come into the shop saying how they see flies everywhere, but could not get any fish to come up and eat their offering. When I ask them if they nymphed, I often hear "no". So if you are wondering what the status of the famous Deschutes stonefly hatch is, you can be confident that you are not fishing past the peak of it yet. It still has not peaked, and the very best dry fly surface action is yet to happen. With that being said, get yourself out there to enjoy one of nature's most awesome spectacles. 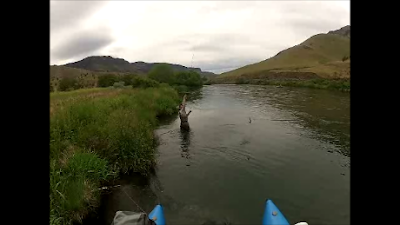 If you have not ever experienced the Deschutes River's Stonefly hatch, then you need to because watching aggressive hungry rainbows eat your two inch long fly is totally awesome!